Christine Morla combines images from her Filipino-American background to create art that expresses universal statements about family, world events and popular culture. She is a mixed-media artist who appropriates images from television, print media and family photos, combining them with a painter’s creative vision, at times creating a barely perceptible sense of disorientation. Flowers in the Wind reflects a haunting and playful mix of colorful images, some delicately covered by a sheer veil, and expresses futuristic landscapes. This is in contrast to earlier work that has been described as violent and chaotic, often with a politically charged frame of reference. 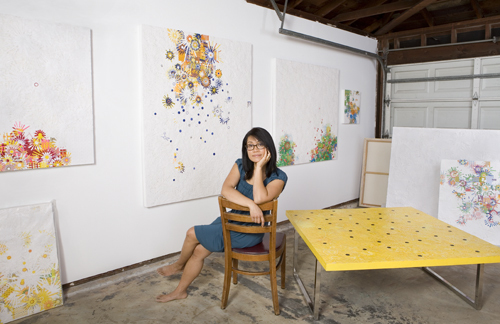 Morla, an Oxnard native received her BFA from Loyola-Marymount and her MFA from Claremont Graduate University. Her work as an educator at Oxnard College, where she chairs her department, teaches, and directs the McNish Gallery, reflects the positive mentoring she received from her teachers. She delights in bringing students with no previous art experience into a world that is new to them. Christine Morla’s documentation took place in 2007 and was sponsored by Jim and Mary Galbraith. The FOTM Archive contains extensive information about this artist.